Sign Up for Your Online Account! That's right, your Weed Pro account is at the tip of your finger! Follow these simple setup steps! 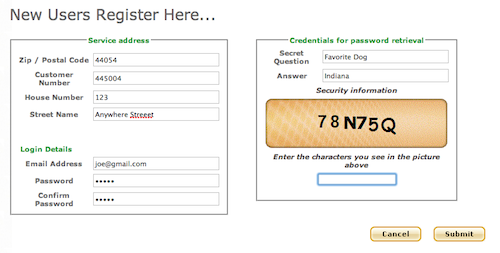 Step One: Go to "My Account" located on the top of this page to enter our Secure Online Account Center. On the left below the "Log In" button in the "Log into your Weed Pro Account" box, click the "Create an Online Account" link. Step Two: Fill out the form, with your Account Number (Located on Your Statements/Invoice/Prepay), street address, street name, & email address. Additionally, choose a password and security question. Step Three: You're Done! After completion of the registration form, you'll be taken to your account screen where you can pay your bill, adjust services, request a service call, and contact us! *Note that account may require 24 hours to load current balances on some occasions. If this happens, please call us so we can expidite the process. $5 credit is a one-time credit only for those who sign up for Auto Bill Pay that charges a credit card after each purchase. Prepay customers are ineligible for $5 credit. 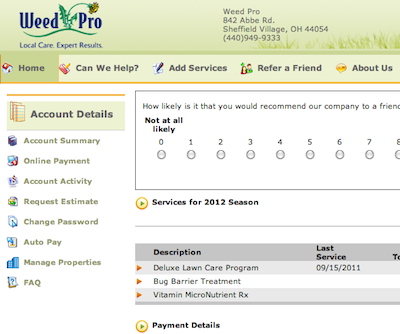 Use the form below and a Weed Pro Representative can help walk you through the process.